Ski homes remain a staple of global property portfolios but their discretionary status sets them apart from other housing markets. Housing stock is limited (even before you take into account the Swiss rules and regulations) and new development can be expensive (given the logistics of building on mountain ridges) but it is these challenges, and ultimately the lifestyle that they provide, which strengthens the appeal of a ski home amongst the wealthy. Over the next few pages we provide a comprehensive round-up of the key trends influencing the top Alpine resorts and, with the help of our US partners, Douglas Elliman, we venture into Aspen and Vail for the first time. The results of our Alpine Property Index highlight the impact Swiss policies such as Lex Weber are having on market performance but also the extent to which buyers are hunting for value, Chamonix for example continues to perform well. Our resort-by-resort Alpine infographic provides potential buyers with a onestop guide to determine the strengths and weaknesses of each resort, from the resort’s altitude and season length to journey times from the nearest airport. With over 94% of our buyers telling us they plan to rent out their ski home, primarily to cover costs and finance personal trips, we have taken a closer look at which resorts are ploughing funds back into their local infrastructure, a valuable indicator of future tourist demand and long-term liquidity. Investment is a theme continued in Aspen and Vail, both resorts have invested heavily in their provision of year-round activities in recent years as the challenge to become truly year-round resorts mounts. The final section of the report hints at where the next ski hotspots might be, with Asia and Eastern Europe tipped for strong growth. We also share our thoughts on future trends and the likely impact of the UK’s Brexit decision on the Alpine property markets. Knight Frank’s Alpine Property Index is now in its sixth year and tracks the performance of luxury ski homes across 15 major resorts in the French and Swiss Alps. Unlike in 2015 when the French resorts dominated the top half of the rankings, and with Swiss options dominating the lower half, this year there is no clear division between the two countries. Perhaps surprisingly, given the strength of the Swiss Franc and tight restrictions on foreign buyers, Gstaad proved the strongest performer in the year to June 2016 with prices rising by 13% over the 12-month period. Luxury prices on average increased from CHF30,000 per sq m to CHF 34,000 per sqm due to a dearth of quality stock, the Canton of Bern’s favourable tax regime, and, for those looking to become permanent residents, the quality of its international schools. The Three Valley resorts, along with Val d’Isere, proved another standout pocket of growth. Continual investment in the resorts by the owner, Societe des 3 Vallees (S3V), has reinvigorated both tourist and buyer interest. Ongoing investment – particularly in resorts which in some cases date from the 19th century – is increasingly a key determinant of performance. There is a noticeable correlation between this year’s index results and those resorts renewing their ski infrastructure and investing heavily in the wider provision of non-ski activities. Both Val d’Isere and Chamonix tick these boxes, here prime prices rose on average by 6% and 5% respectively over the 12- month period. Aside from Gstaad, the index is characterised by minimal price shifts, more than half the resorts saw prices move by less than 3%. In some Swiss markets the lack of product for foreign buyers – who are usually only permitted to purchase a property up to 250 sqm in size – has supported prices. The index as a whole increased by 1.8% in the year to June 2016, more than reversing the 1% decline recorded last year. While the index results provide an indication of property price movements across the resorts it is important to distinguish the degree to which luxury prices vary across the Alps. Figure 1 highlights how many square metres can be bought in each resort for €1m based on typical values at June 2016. The most expensive resorts of Gstaad, Courchevel 1850 and St Moritz, where prices range between €23,000 and €31,000 per sq m, would in return for €1m, provide between 32 and 44 square metres of living accommodation. 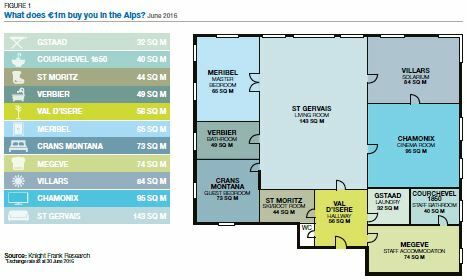 Compare that with the resorts of St Gervais and Chamonix where prices are close to €7,000 per sqm and €10,500 per sq m and a buyer would, in comparative terms, acquire an almost palatial 143 square metres and 95 square metres respectively for the same €1m investment. Most buyers will know from the outset whether they want to purchase a ski home in France (motivated for example by the short drive times or the new-build VAT incentive), or Switzerland (due to the privacy and lifestyle it affords), but the next decision is which ski resort best suits their needs. Travel times are critical, particularly if owners want to make use of the property for weekend ski breaks. Located around an hour from Geneva Airport, Megeve and Chamonix rank highly in this regard and represent good value but at midaltitude they have shorter seasons. There is therefore a direct correlation between altitude, season length and as a consequence property prices. The high altitude resorts such as Val d’Isere, Gstaad and Courchevel 1850, where ski seasons extend beyond 23 weeks enable longer rental periods, and therefore command higher property prices. Renting out is now the norm. The days of retaining a ski property exclusively for personal use have disappeared, even in the super-prime market (€10m+). However, the aim is to cover maintenance and personal overheads rather than build a high-yielding investment. The reality is most ski homes generate a 2% to 2.5% return. Swiss resorts and those in the Three Valleys, where snowfall is more reliable, can produce higher returns. For Swiss residents, there is a need to balance cantonal tax rates with lifestyle gains. The most favourable canton for tax may not necessarily provide the lifestyle many buyers seek as we discuss further in our Global Lifestyle Report. Personal safety is also emerging as a key buyer motivation. Crime levels and security threats are low in the Alps. Privacy and discretion are highly valued in resorts such as Gstaad and St Moritz, residents often know each other by sight, heightening their sense of security. Buyers now adopt a 5 to 10-year view when purchasing a ski home and increasingly place great value on the liquidity of their asset. Keeping an eye on planned investment projects is a must. Aside from the specification and maintenance of the ski property itself, which is at the owner’s discretion, it is the location which determines the desirability and hence the future selling price. Buyers want to know that when they decide to sell they can do so quickly and move on. The investment plans and strategy of the major resort owners are increasingly being scrutinised by buyers. Key issues of interest to potential buyers include whether the resort has plans to link up and create a wider ski domaine, if the lifts are to be upgraded, if luxury brands are leasing retail space, or if new hotel groups are exploring key sites. There is logic in their thought process. A savvy buyer knows that higher tourist numbers mean fewer void periods, higher returns and ultimately a more attractive and valuable asset. Some resorts identified the value of investing heavily in the resort’s ski and non-ski infrastructure decades ago and it has reaped rewards. Val d’Isere and Verbier are recent trailblazers ploughing significant funds into their amenities, however the resort which can lay claim to the title of most well-serviced year-round resort is Chamonix. Chamonix is first and foremost a town with over 10,000 permanent residents and summer visitors eclipse its winter tourist numbers. Resort owner’s Compagnie du Mont Blanc is committing a further €477m of investment over the next few years to upgrade the lift system and part of the valley’s infrastructure. Europe’s longest mountain range is now a playground for families in the summer months. Mountains, not beaches, it would seem are en vogue as families embrace healthy lifestyles and take advantage of the long summer break to learn new skills and pastimes from glacier skiing to bouldering or paragliding. A decade ago restaurants and shops in the Alps closed at Easter and reopened in November but most are now open all year round adding greater vibrancy to the village resorts in the summer. Ski lifts in some resorts run all day providing access to the summits and several operate for free during the summer months. Passenger numbers to Geneva and Lyon Airports are now higher in summer than in winter in cumulative terms, whilst Chamonix is credited with more than 2 million overnight tourist stays each summer. As we explore on page 6, by offering a broader range of activities from cycle trails to ziplines and from food to music festivals the resorts have met and encouraged this previously untapped pool of demand in the summer months. A boon for second home owners, we expect this trend to strengthen as transport links and the range of amenities are set to improve further. Buyers can reclaim the VAT (20%) on the price of some off-plan properties by committing to renting out their home for a period of 20 years. The rule applies to French and foreign buyers alike and extends beyond the Alps to all new-build property across France. Under French tax rules, VAT of 20% is added to the basic purchase price of off-plan properties in France. If the owner decides to remove the property from the rental market or indeed sell it, then they have to pay back a proportion of the VAT. For example, if the owner sold after 10 years you would have to repay 50% of the VAT. These services can be contracted out and it can equate to a relatively low cost in return for a significant saving. For example, purchasing a new-build apartment for €480,000 would result in a saving of €80,000. Knight Frank do not offer tax advice, this commentary is provided for information only and should not be relied upon, you need to take specialist advice from your tax advisor. Please refer to the important notice at the end of this report. Building on their reputations as truly year-round destinations, the United States’ premier ski resorts are seeing strong levels of new investment which is attracting a broader pool of demand. In 2015, the number of ski visits in the US exceeded 55m but unlike Europe’s Alpine markets, the US is primarily a domestic ski market with 94% of the country’s ski visits undertaken by US skiers. Colorado is responsible for over a quarter of all ski visits in the US and its 21 ski resorts boast the strongest international profile. Although small in number, high net worth individuals from Australia, the UK, Eastern Europe and Asia are increasingly adding Aspen and Vail to their global property portfolios. Both resorts recorded price falls of 30% to 40% in peak-to-trough terms during the downturn of 2008-2010 but have since seen their level of sales activity recover with record prices now being achieved in some neighbourhoods. Compared with neighbouring Snowmass, Aspen is relatively small in size with a resident population of fewer than 6,000 which swells to 27,000 during the peak ski season. Since the market downturn, prime prices in Aspen have climbed steadily, averaging an annual growth rate of 4.7%. Following a stellar year in 2015 when sales volumes in Aspen increased by 10%, the narrative in 2016 has shifted slightly. Total sales volumes declined during the first half of 2016 but prices have been unaffected. Above the US$8m price point, inventories are rising but the market below US$5m remains active. The strength of the US dollar, the forthcoming US presidential election and volatility in the financial markets may be contributory factors but so too is the lack of new product. Luxury buyers are increasingly keen to design their own homes incorporating the latest technology, open plan layouts and top of the range specifications. However, planning regulations in Aspen are strict; the total floor area of newly-built properties cannot exceed 5,750 sq ft. Buyers want one of two extremes, either proximity to the town itself – in which case their search focuses on Red Mountain, West End and Core Aspen – or open space and vistas which leads them to areas such as Starwood and Wildcat. US buyers dominate, particularly those from New York, California, Texas and South Florida with many heading to Aspen for the cooler summer climate. According to Douglas Elliman’s Joshua Saslove, summer, not winter, is Aspen’s busiest season as the town hosts a packed social calendar of music, food and cultural events, many hosted by the acclaimed Aspen Institute. Located 100 miles to the north east of Aspen, Vail is served by nearby Eagle County Airport. The town, home to 5,000 permanent residents, is spread across 4.5 square miles. The resort is comprised of five key neighbourhoods including Vail Village, Lionshead, Vail Golf Course, Spraddle Creek and Cascade Village. Since 2010, the market in Vail has followed a similar trajectory to that of Aspen. However, total sales volumes for the town in the first half of 2016 eclipsed that of 2015, increasing by 7%. A lack of inventory is proving to be the main challenge for the two key submarkets of Vail Village and Lionshead. Buyers looking to design and build their own home often gravitate to Vail given plots are more easily available than in Aspen. In 2015 more than 151 land plots changed hands equating to a total sales value of US$56.6m. US ski resorts received a welcome boost in 2011 when a new Federal Act was passed allowing the US Forest Service greater leeway when approving new projects at ski resorts. This has allowed Vail Resorts Inc. to invest over US$25m in a new centre offering non-ski activities during the summer months such as aerial adventure courses, ziplines as well as hiking and biking trails. By 2020 the world’s ski resorts are forecast to attract more than 420m ski visits per annum but the growth markets are not expected to be in Europe or North America but in parts of Asia and Eastern Europe. Japan’s ski resorts surged in number during the 1980s but the following decade saw interest wane due to the economic downturn. Niseko, located on the country’s northern island of Hokkaido, is the country’s largest ski resort, boasting 55 km of pistes and one of the world’s largest night skiing operations. New investment is now taking place but Japan’s ageing population remains a key challenge for the industry. Competitively priced compared with neighbouring Japan, South Korea offers facilities of an international standard as well as a good range of non-ski activities from retail to water parks and golf courses. Bansko, home to 5-star hotels and state of the art ski infrastructure, is Bulgaria’s highest quality resort. More than £95m was initially invested by the Sofia-based owners to transform it into a modern ski resort, it now boasts 75kms of ski runs and 14 ski lifts with a capacity of 23,100 people per hour. Skiers seeking a cheaper alternative to the Alps are heading to Bulgarian resorts, with interest from the British, Turkish, Greeks, and French on the increase. There are over 170 ski resorts in the Czech Republic, most located in the Giant Mountains National Park to the north of the country on the Polish border. Špindlerův Mlýn is the Czech Republic’s equivalent of Chamonix offering 25 kms of groomed ski slopes, 5 chairlifts, 11 ski lifts, and 85 kms of cross-country trails. The low altitude is offset by snowmaking canons enabling skiing to take place throughout the winter season. Since the late 1940’s the ski resort of Shymbulak in the Medeu Valley, near the city of Almaty, has attracted skiers from across Central Asia and Eastern Europe and for several decades it was the resort of choice for Russian skiers. A wave of new investment has put the area back on the map and there are plans to develop several new resorts. The challenge the ski industry has is ensuring that it’s widening geographic appeal offsets the expected generational downturn as the snow-loving baby boomers in the west start to decline in number. Millennials are more transitory in nature, some will show allegiance to one resort, acquire a base in the mountains and return time and again but others may opt to rent in a different resort each season. We expect most resorts to see marginal price movements in the next 12 months, Switzerland may prove the exception to the rule, particularly those resorts where inventories are severely constrained due to the second home cap and foreign purchaser rules. New-build developments across the Alps are likely to command a premium given the lack of sites but particularly in France due to the attractive VAT rebate. The redevelopment or extension of older chalets is set to continue with some in the Swiss resorts split into 250 sqm units. Aparthotels, defined as commercial units, will become more prevalent as developers in Switzerland look to find ways to accommodate Lex Weber’s second home cap. The launch or refurbishment of top branded hotels will be a precursor for wider gentrification. The Four Seasons in Megeve, the W Hotel in Verbier and the Grace Hotel in St Moritz will spur regeneration across each of the resorts and cement their positions as premier ski destinations. The UK’s decision in June to leave the European Union has not led to a sudden market downturn nor have we seen sales in their early stage of negotiation fall through. Vendors across Europe are less reliant on British demand, there is a broader cohort of buyers with new wealth emanating from Asia and the Middle East which is filtering into the ‘lifestyle’ market be it ski homes, vineyards or boutique hotels. Summer is usually a quiet period for enquiries and it will be hard to accurately gauge demand until November but enquiries have remained largely static in July and August compared with the same period in 2015.